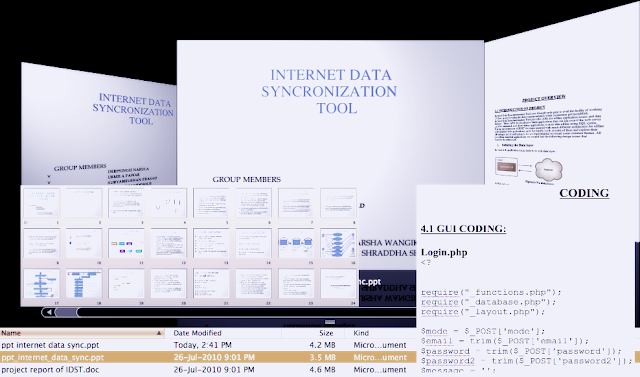 CSE engineering project: Internet data Synchronization tool (With full coding) ~ Engineering projects ideas for final year students & paper presentations collection blog. Title: Internet Data synchronization tool. Department: Computer science, Information technology, software development. Can be used: CSE projects, Final year project, engineering projects and educational purposes. This project we found while surfing on some of the top engineering forums. The best thing about this computer science engineering projects is, this project folder contains all the needed information readymade for you. This will be a great help for young students who are in need of a ready material, for some immediate seminar or project display. The pack contains that presentation in .ppt format and the documentation and the entire coding of this project. This project is about making the offline surfing more efficient. Internet Data Synchronization Tool uses Google code gear to avail the facility of working off line, and providing the data synchronization when connection get reestablish. Internet Data Synchronization Tool provides APIs for offline application access and data storage. These APIs let developers build applications that can run even if the web server can't be contacted, and allow those applications to store data offline using SQL syntax. During development of IDST we experimented with much different architecture for offline web enabled web applications, now we briefly Look at some of them and explore their advantages and disadvantages As we experimented we found some common themes. All the offline Enabled applications we created had the following design issues that Need to be addressed: and more..